Jane Lawless has had a long year: she just broke up with her girlfriend in the fall, and her relationship with her brother has been strained even longer. Her two restaurants are still running in the face of the recession, but Jane has barely had time to breathe. Surprise is an understatement when Chester Garrity walks into her place again. Married in college so that Chess could get his inheritance, Jane received enough money to start her first restaurant after their divorce. Now Chess is back and in trouble, and the more Jane gets involved the more she learns that Chess is not everything he says he is, or was. With more secrets being revealed, Jane is up against various interested parties in the looted antiques, a jealous married woman infatuated with Chess, a revelation about her marriage of long ago and possibly the loss of one of the most precious people in her life. 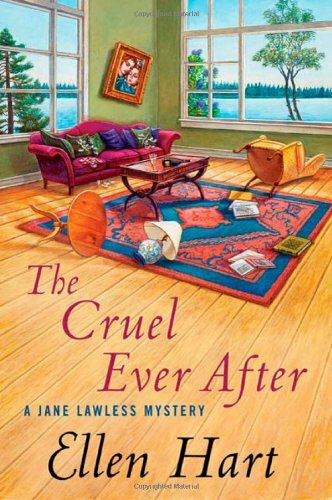 Well, this whole book through me for a loop because I have been reading Ellen Hart's Jane Lawless series from the beginning and never ONCE remembered any mention of Jane being married. Judging by the dialogue of characters throughout the book, it is a revelation to everyone. With chapters alternating between characters, Hart builds the suspense to a climactic finish. After 18 books, it would certainly be easy to slow a character's story down and lose interest, but Jane's life has been able to take enough different turns, along the supporting characters of Cordelia Chase and Jane's family, to keep the interest of any sustained series reader. The one minor downside to the book is that there are a lot of characters that get small side stories in this book, but Hart weaves it all together at the end. Some may also think that a couple ends were tied a bit too tightly in this book, but there was a real need for that and I don't think there is any loss with the ending.